Expert in the mastery of titanium G5 – a metal that is particularly difficult to machine – Volna has triumphed with the very complex construction of the Typhoon Siberia in this high-tech material which gives it both strength and lightness. 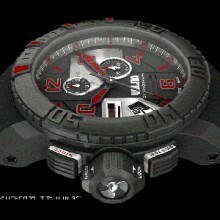 The case, bezel, crown and push-pieces are all executed in titanium grade 5 in two series each limited to 125 examples. Here exclusivity and technical expertise go hand in hand. Highly technical, virile and sporty, the new Typhoon Siberia chronograph from Volna in titanium grade 5 has the exclusivity that is to be expected of every exceptional object. It allies a modern, ultra-light, rugged construction with great legibility and high precision functionality. It is also demonstrates Volna’s perfect command of the techniques of machining complex, high-tech materials including titanium G5, a metal which is twice as light but paradoxically twice as tough as steel. The difficulty of machining it is why this material is relatively little used in watchmaking. Normally used in the medical field because it is nickel-free, in addition to its lightness, titanium grade 5 has the advantage of being completely hypoallergenic. The Typhoon Siberia chronograph from Volna has a three-piece case worked with a concern for perfection which only the greatest makers can boast of. The alternation of polished, satin and microbead finishes requires very special skills to carry out the work on each of the elements which play a part in the composition of this top-of-the-range timepiece. A sports watch par excellence, every detail of this chronograph has been carefully thought out to combine efficiency and ease of use. The shaped crown is easy to grip and is marked with directional indications. It is connected to the security indicator on the dial which confirms that the case is water-resistant again after the crown has been operated. The hands and the applied oversize numerals and markers are coated with the red Superluminova that is characteristic of the brand. The chronograph functions, security indicator and date are particularly easy to read, being set in applied ruthenium panels satin-finished and angled by hand. The notched unidirectional bezel is quick to grasp and easy to control. Similarly, the generously sized push-pieces pick up the faceted forms of the horns and the crown, giving this timepiece a very exclusive aesthetic and dynamic.